Take a Tour of StickerGiant and Learn How Custom Stickers are Created! We have always loved showing people around our shop, and sharing the magic behind how we bring custom stickers to life for our customers. Now, our tours of StickerGiant are going public with a weekly tour scheduled every Friday at 2pm MST dedicated to showing everything we put into our process. 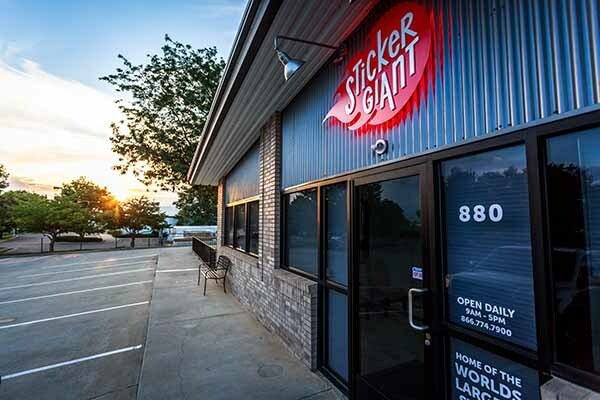 A Tour of StickerGiant starts with an introduction to Saul, the World’s Largest Stickerball, and Guinness World Record holder. You will also have a chance to add your name to Saul, and become a part of his Sticker Story. After meeting Saul, your journey will continue through the shop, and follow along with the path a piece of custom artwork follows in becoming a custom sticker. This includes a visit with our Art and Pre Press Teams to see how artwork is setup for our printers. Then on out to our HP Digital Presses where all of our printing happens. After seeing the technology behind how we print stickers, the next stop on our tour is our Finishing Stations, where our stickers and labels are cut to custom shapes, and finished to be delivered to our customers. You really will get to see every part of how StickerGiant runs its daily operations and brings custom stickers to life! Tours will be every Friday afternoon at 2:00 with the exception of some holidays. The full tour will last up to 45 minutes from start to finish. You will be on a walking tour of the StickerGiant factory, which is roughly 12,000 square feet. Please be prepared to walk up to ¼ mile for the full tour. Reservations are required for a tour of StickerGiant, and spaces are limited to 10 people per tour. Please use the form below to secure your space(s). Children under the age of 18 must be accompanied by an adult during the tour. Service Animals are not allowed on the factory floor for quality control during the sticker printing process.